Becky G Announces The Release Of Her New Single - "LBD"
This week’s New Music Friday just got a little sexier and more star-studded. January 18 is the day we’re due to receive Ariana Grande’s friendship ode “7 Rings.” Anticipation is sky-high for the follow-up to her chart-topping “thank u, next.” However, Ari isn’t the only diva dropping something at the end of the week. 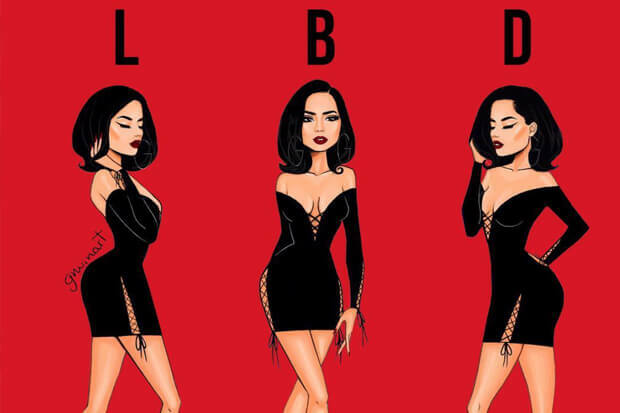 Today Becky G confirmed that she’d also be unveiling her new single “LBD.” The 21-year-old started teasing the track’s title – short for little black dress – over the weekend. Today, she hopped on social media to confirm the release date and share a snippet and the cover art. “Every time you see me with my new black dress on, know you need me,” she coos over a slinky production. It sounds like the triple threat (singer, actress and makeup ambassador) has a simmering hit on her hands to kick off the new year. She wrapped up 2018 by joining Anitta on a remix of Maluma’s “Mala Mia.” The reimagined track has already been streamed more than 11 million times on Spotify and could easily hop back up the charts with a little more promotion. Hopefully, Becky will have similar results with her next solo release. One thing that is almost guaranteed is that she will be putting together another eye-popping music video. The visual queen dominated YouTube with “Mayores” in 2017 and “Sin Pijama” in 2018. “LBD” may very well be her next viral release. While we wait to find out, check out the teaser and full cover below! #LBD COMING THIS FRIDAY!!!  This song has been sitting in my phone for a long time and I’m sooo excited for you guys to hear it! I know it’s been a minute since my English music… lol ok a super long time, but it’s finally coming!! As an artist I just want to make things that I actually love and want to play. I’m extremely proud of what’s to come and can’t wait to share it with you. Thank you for being patient and sticking with ya girl through all these years. ❤️ This Friday, from my phone to yours… LBD IN 4 DAYS!!! Are you excited for the new bop? Let us know below, or by hitting us up on Facebook and Twitter!